BitTorrent’s Dropbox competitor Sync received a major update Tuesday that makes it even easier to share files with friends and contacts: The P2P-based file synchronization tool can now be used to generate web links for shared files and folders. BitTorrent also announced Tuesday that Sync has already been installed 10 million times, and been used to transfer more than 80 petabytes of data. 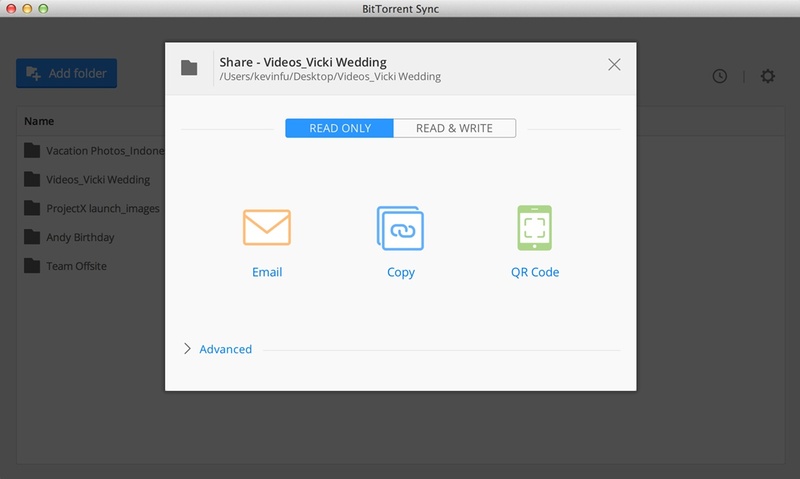 When [company]BitTorrent[/company] first launched Sync with a closed pre-alpha in early 2013, the emphasis was on folder synchronization across desktop computers and network-attached storage drives. BitTorrent subsequently also released Sync versions for Android, iOS and Windows Phone, giving users an easy way to back up all the pictures off their phone, or synchronize desktop folders with their tablet. However, inviting others to access a shared folder had always been a bit complicated: File transfers were both encrypted and without any central server, so users had to exchange cryptographic keys in order to securely share data with each other. BitTorrent tried to make this easier by adding QR codes, but it was still a bit of a roadblock. That obstacle is now gone, thanks to Sync’s new ability to generate web links for shared folders. These web links prompt invited users to install the latest version of Sync, and then automatically initiate a download, provided that the other user is online as well. Web links automatically expire after three days, but users can change this to make folders available permanently, or have them expire even sooner. Links can also be limited to a certain number of users to prevent accidental sharing, and users can choose to individually approve each user, either just by name, or by comparing cryptographic keys. And users who don’t wan to generate a web link can still share data the old-fashioned way by sharing cryptographic keys directly. Sync can also be used to share folders of any size with a team of users. This could be great for small companies, or any other team that doesn’t want to rely on cloud storage for one reason or another. And since it’s P2P, access to that folder can be significantly faster than to a cloud service: A co-worker in the same office can access it over the local network, and even remote coworkers can get a boost when multiple members of the team are sharing the same files — Sync automatically downloads files from multiple locations. That ability to share files within company teams is interesting for a number of reasons. Many traditional cloud storage and backup tools started out as consumer-focused tools, only to eventually focus on the enterprise. However, Eric Pounds, BitTorrent VP of product management, said that this isn’t necessarily Sync’s future. “At our heart, we are a consumer company,” he told me during an interview last week. Still, Pounds made it clear that Sync has become a pretty big deal for the company. First developed at an internal hackathon, Sync has now become the project that a quarter of BitTorrent’s 180 employees is working on. Pounds added that the company wants to get Sync out of beta early next year, and eventually add premium features to it as well.